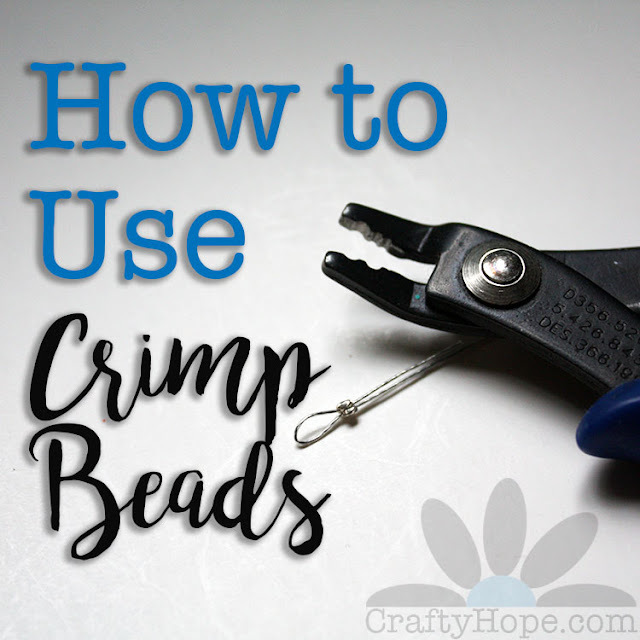 On each of my vacations, I make an attempt to take some craft supplies with me in the hope that I'll be extra-inspired by all the fun and relaxing I plan on doing. This last vacation was no exception. However, I did put a little twist on my usual craft bag. First off, I took WAY LESS than I usually try to pack. 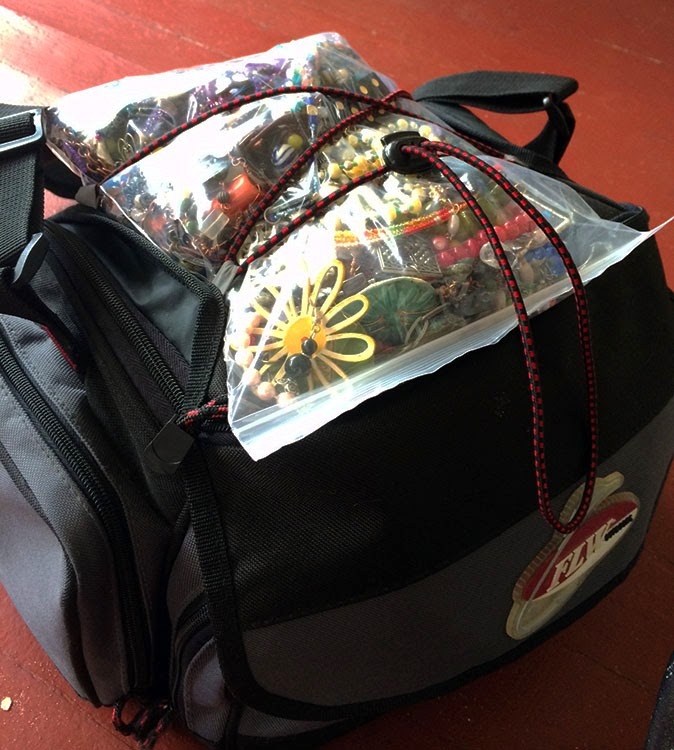 In fact, all I took was this one little bag (it's a small fishing tackle box that fits only three organizers in it). 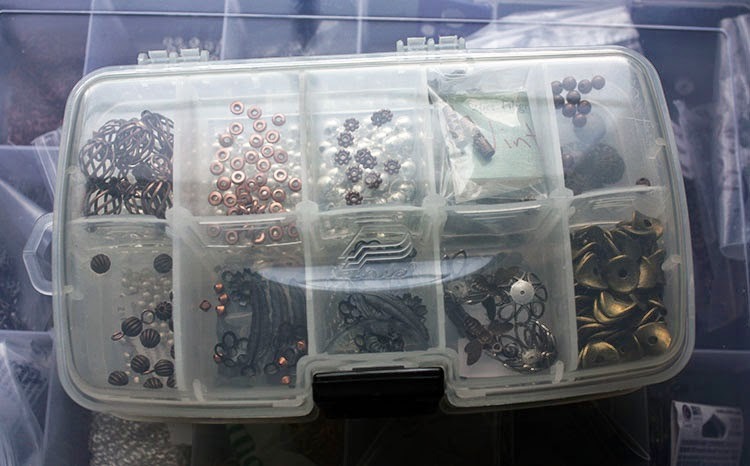 Strapped to the top of the tackle box is a baggie full of jewelry that needed to be taken apart/trashed. 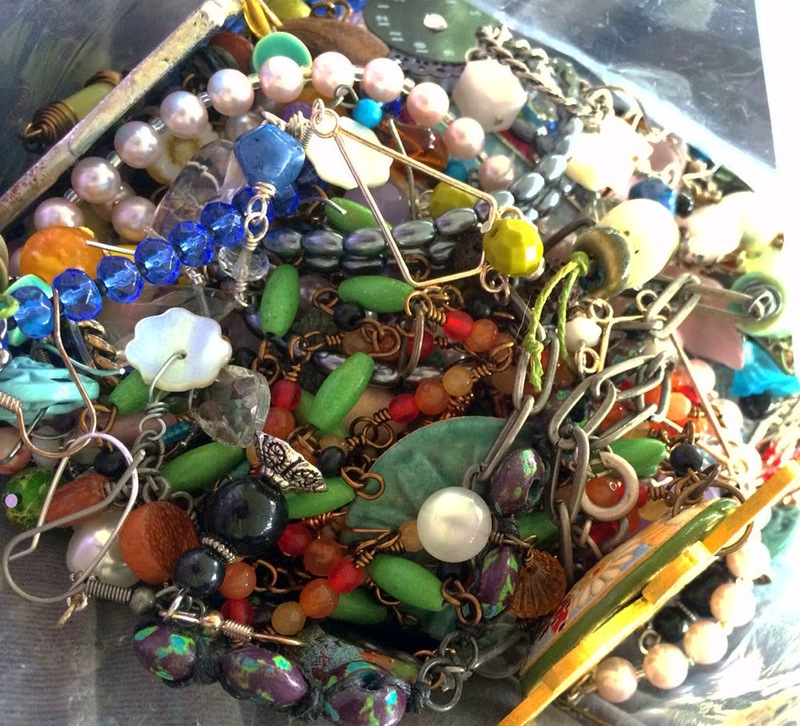 Let me go ahead and admit that taking apart the jewelry in that baggie is all I got to work on the whole two weeks. 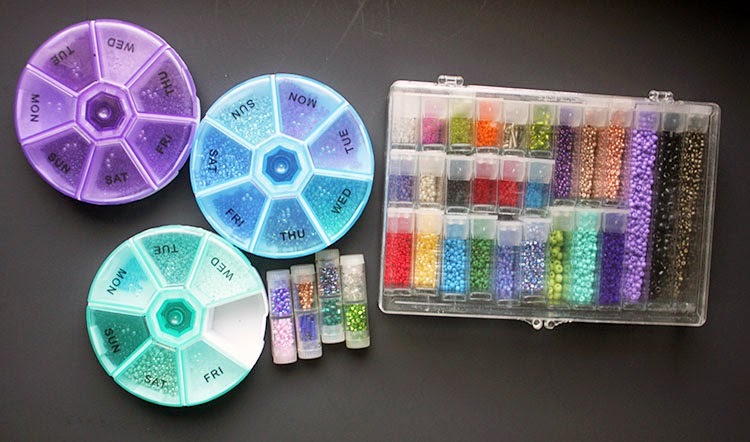 But now that it's taken apart, I've got a whole organizer filled with beads simply sorted by color for me to use. 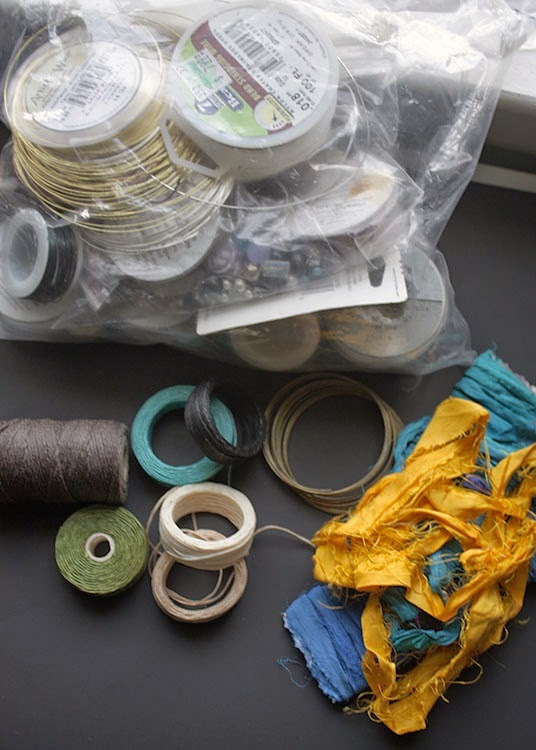 In addition, I packed wire, waxed linen cord, and some recycled sari silk. 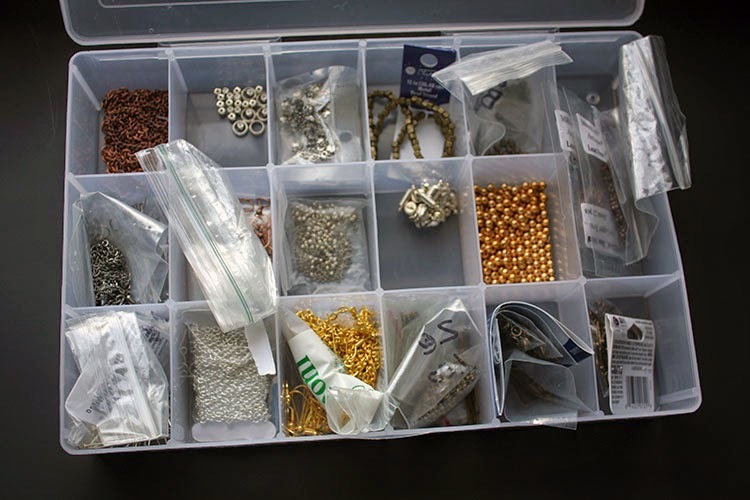 along with a bit of metal findings, chain, beads, and accessories. 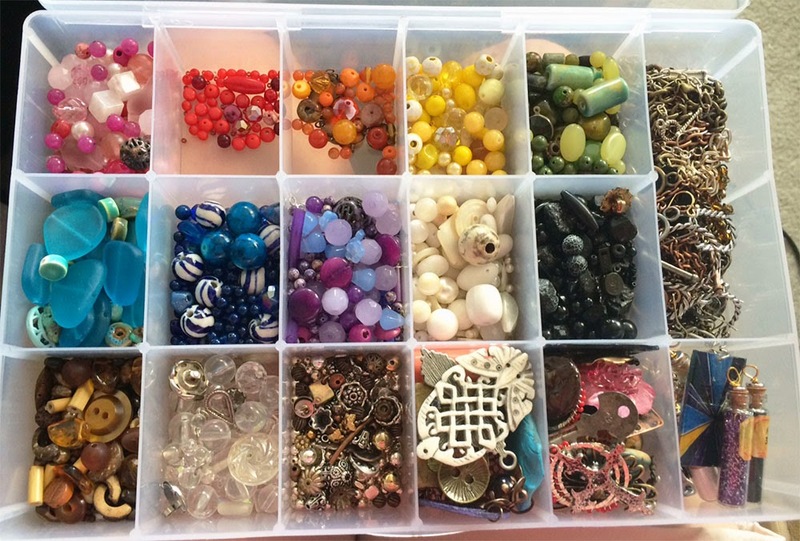 This container (below) WAS empty and ready for me to fill up with the beads and whatever miscellanea I could salvage from the trash jewelry. 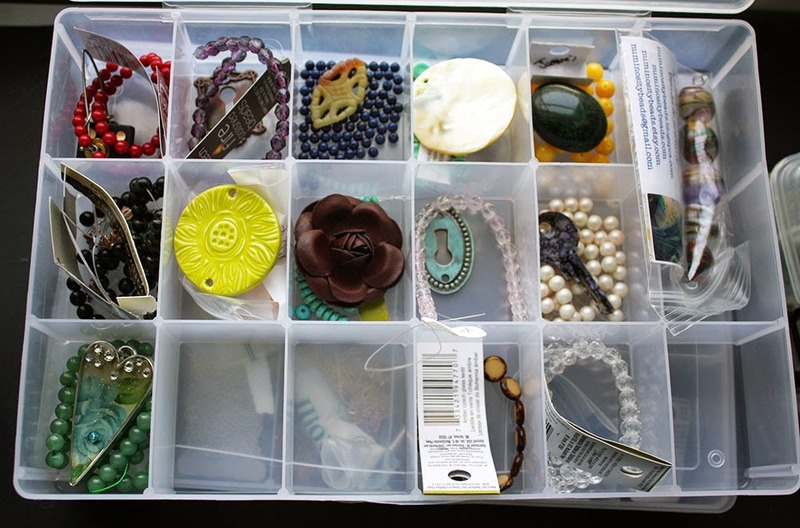 Finally, (this is the container that had me the most excited, and I'm still itching to get into it) I picked out a selection of 'focals' and a single strand/color of bead to coordinate with each of them. 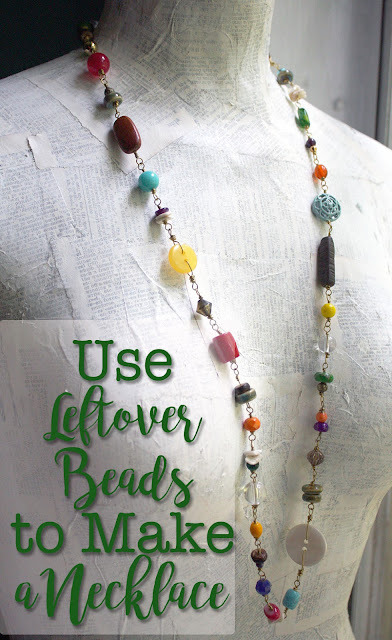 I figured I'd use the beads from the trashed jewelry to fill out each of the designs. 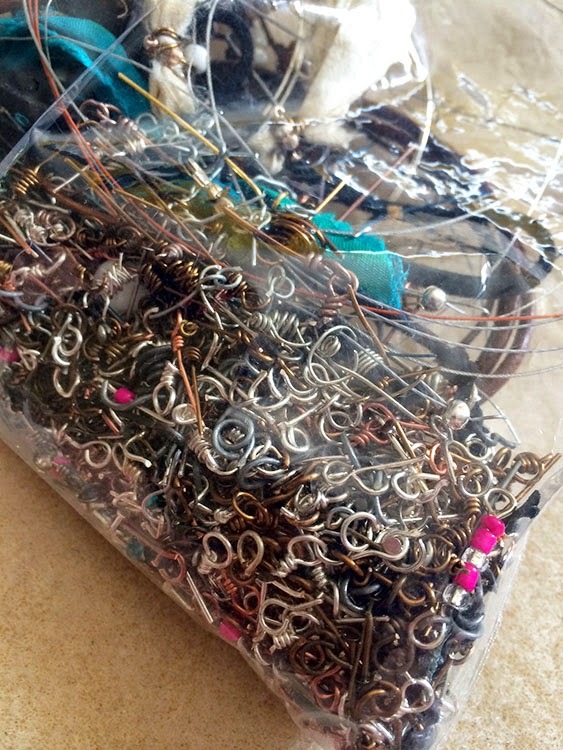 Alas, it took me forever to get through the taking apart of that baggie of jewelry. There was a lot of wire, leather, fabric, a few beads, and many hours of work simply thrown away. At least I had a lovely view while I was being so destructive. 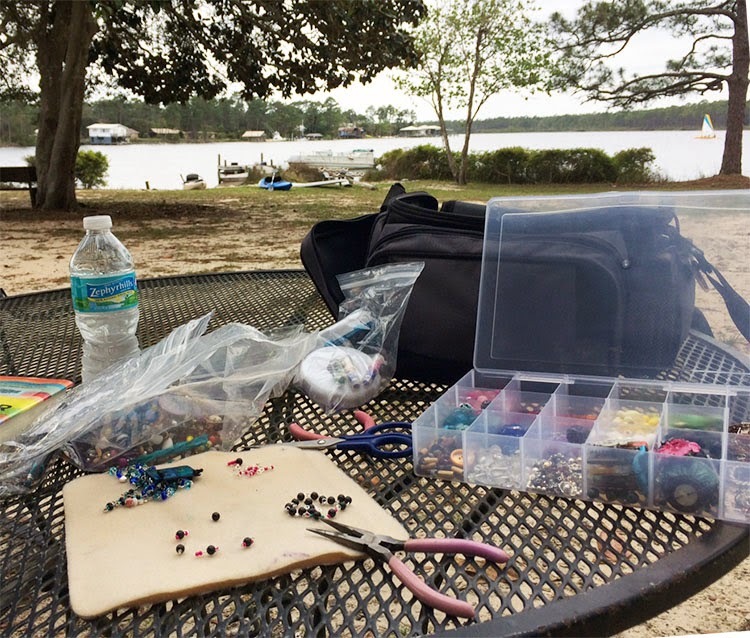 Do you pack a craft bag to go on vacation/travel? What's your method for it? 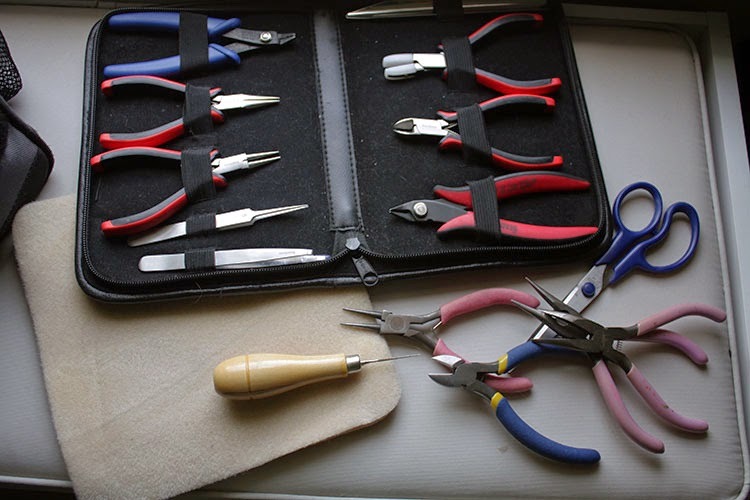 A nice post- thanks for sharing so detailed and inspiring. I sometimes pack the started projects, in hope to finish- sometimes I do. Sometimes I lack something important ;( then I find a way out or, then I have to be patient till i come back home. 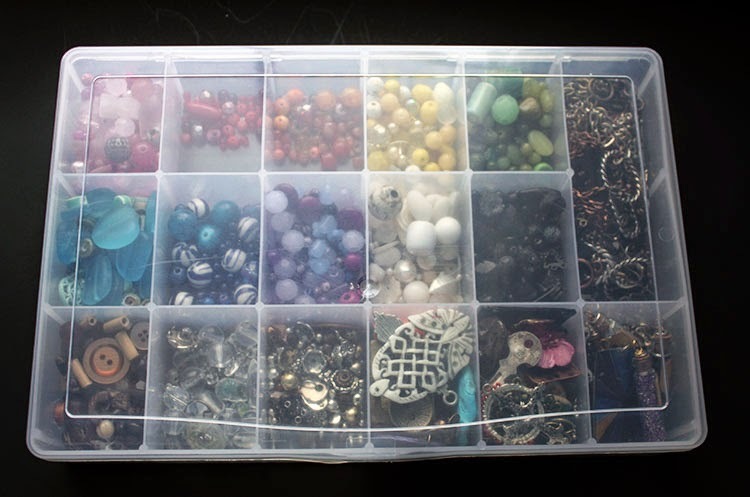 ;) However, your way is for a longer holiday, and you were forced to take apart the jewellery otherwise you wouldn't have, Now it was a good opportunity to do it. You could show us what you have made. .... greetings from All in Beads! Since I don't make jewelry, this is another lesson for me as to why prices are sometimes higher than you would think they should be. There is a lot of work that goes on before you even get to the stage of assembling! Just amazing! Heck, I haven't been on vacation where I am not home that night for years. Too many animals that would freak out at being boarded and aren't good travelers.